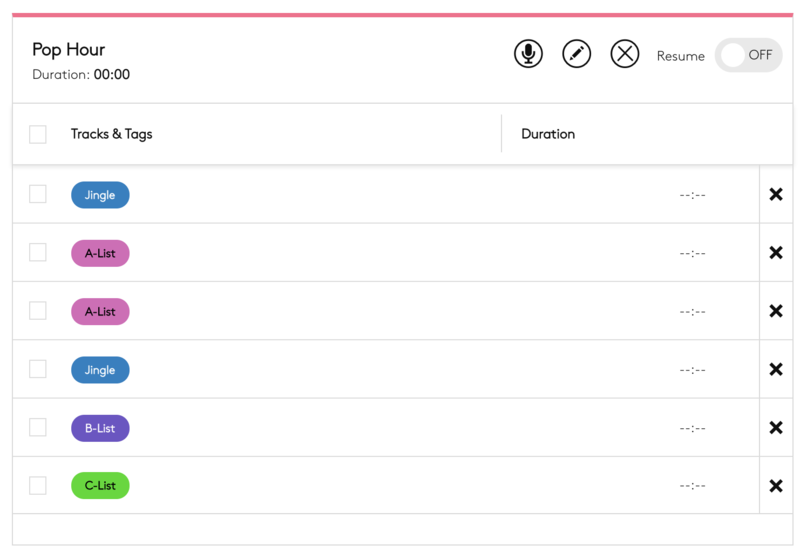 Build your own custom playlists with tracks and tags, then schedule them throughout the day or week within the scheduler. Playlists allow you to curate shows and schedule them on your station calendar. You can form playlists from either tracks or tags, they will always play in the order you add them. To get started head to Playlists in the dashboard sidebar then add the name of your new playlist and choose a colour. Next click 'ADD'. The Playlist editor will then open. On the left side of the dashboard, you will see your tracks and tags. The last 50 tracks uploaded can be found (latest first) under Recently Added. If you are looking for a specific track use the search box at the top of the screen. To add items to a playlist simply drag them over from left to right. If you are on a touchscreen device you may find it easier tapping the + button next to each item. Once items have been added you can re-order them by clicking and dragging on the right-hand list. As you add tracks the playlist duration will increase giving you a rough estimate of your playlist run time. If you use tags in the playlist we cannot show an accurate runtime as we are unable to determine the length of the tracks that would air. Once the playlist is complete click the green Save Changes button in the upper right. If you want your playlist to pick up from where it left off the last time it played turn this option on. By default, it is disabled therefore the playlist will always begin from position 1 when it starts. Click the pencil icon to edit the playlist name and colour. If you are on the Broadcaster, or Station Plan, you can also edit your Playlist Metadata. Click here for more information about this feature. Click delete to remove the selected tracks from the playlist. This option is available on the Broadcaster plan and above. If you wish to copy the contents of your Playlist, go to the Playlist editor and click Duplicate Playlist. This will create a new instance and load up the Playlist editor options. You can then change the playlist name and options if desired.